It's increasingly clear that the pathophysiology of culture goes beyond neurotransmitters. The development of Primus was based on the importance of an essential supplement with this essential: Ω-3 fatty acids. 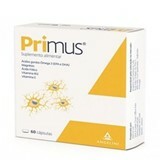 Primus is a food supplement that helps boost anti-depressant therapy.